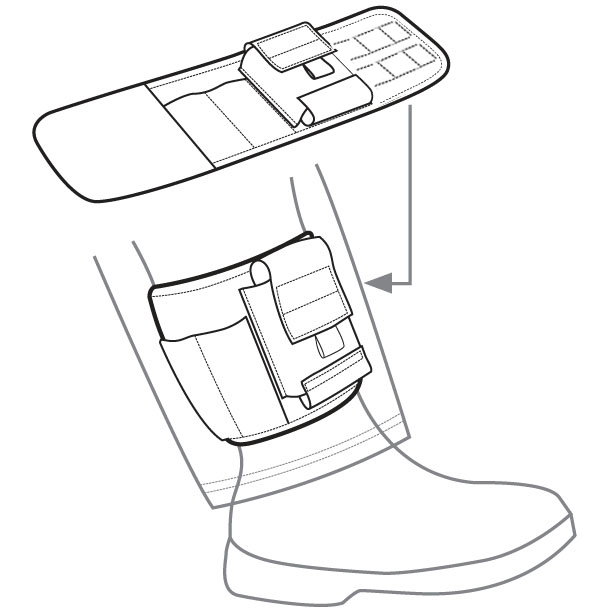 The newly upgraded Ankle Medical Holster is a medical kit carrier designed to be worn around the user's ankle. Lightweight and comfortable, it can be worn as part of your everyday carry whether you are civilian, law enforcement, or military. Upgrades include rounded corners, a 2 x 3 PALS panel, red pull tab, padding for comfort, and an improved fit. Designed to fit a CAT or SOFTT-W Gen 3 Tourniquet, 4" Israeli Emergency Bandage, and 2 pairs of Gloves. It can also accommodate a SWAT-T, needle decompression kit or other items. A stocked version is available as well. Dimensions (intended fit circumference): 9" - 16"
I have taken 3 combat medical trauma classes in the last 5 months. It is hard to add more gear to your waist belt - duty or civilian. I bought this ankle model and have worn it 16 hours a day loaded with no comfort complaints. I wish the loops were elastic instead of solid cloth. I carry a CAT tourniquet, a wound pack cloth, an Israeli bandage, Gorilla tape on a second windless rod, 2 pairs of Rescue Essentials rolled up gloves and one chest seal patch. I cut the bottom base material open on one pocket to make the CAT fit. I am prepared to save one important life for sure - mine. I have the following in this: (1) Bearclaw gloves, (1) Epi-Pen, (1) Benchmade 7-Hook, (1) 50g quickclot sponge, (1) NAR Compressed Gauze, (1) Set Hyfin Vented Compact chest seals, and (1) Cat gen 4 TQ(Will be switching to a Soft-t Wide for hopefully a slimmer fit). Only complaint is that it needs a calf strap because it does not stay where I secure it. This product is wonderful. The fit is great and I can carry all my important supplies with me without bulky pockets. The holster could use more fully covered pockets but overall a great product. I have worn this medical holster for a few weeks now. All-in-all its been very confortable. I keep a tourniquet, a roll of hemostatic dressing, two vented chest seals, and a small marker in my kit. I would give it 5 stars if the other two pickets had a flap to secure the contents as well as the larger picket. I have had both a CAT and a SOFT-T fall out as I worked through the day getting in and out of my vehicle. I ended up using a thick rubber band to secure the tourniquet in the holster. Maybe I'm wrong, but I intended to wear this product around my ankle with low-top hikers. Way to big for that. The only way I can use it is if I wear it above my calf. Is that where it is supposed to be worn? I guess it would work well over a boot. Very well made though. Thank you for your input. Based on this feedback, we will be including ankle circumference min/max specs into the product description in the near future. We greatly appreciate your communication! I've bought over a half dozen ankle IFAK holsters trying to find the best one, and I finally found it. The size is perfect whether I'm wearing my daily hiking-type shoes and jeans, or my 8" 5.11 duty boots and BDU's. Plenty of room for adjustment for either position. I keep mine nice and compact by way of what I carry: Celox Rapid Ribbon, mini compression bandage, two 4x4 petrolatum gauze, 6' flat folded Gorilla tape, flat folded SOFFT-W, 5" shears, and a pair of gloves. The large pouch with the Velcro flap is the perfect size for the mini compression bandage, petro gauze and the tape. TQ in the pocket right next to it. Then the Celox and gloves in the outside pocket. The shears are tucked into the PALS ladder next to the Celox and held in place with a short piece of double sided Velcro. This holster does not move around, stays securely Velcro'd together, and with the items I'm using is undetectable. It took me getting undressed and my wife seeing me take it off before she even knew I was even wearing it under my jeans. With the extra PALS room, I'll probably use a couple more double sided Velcro strips and attach an NPA. Nice job RE!! Average guy here. Want something for work to carry trauma med supplies so my pockets are not so full. The design of this item is over-sized for what it carries. Could be 2/3 the physical foot print and accomplish the task at holding two RAT tourniquets, gloves, an IZZY 4", possibly combat gauze. Of course there is only one competitor to this item so its what I currently have to work with. 1-2 inches longer overall than necessary. Might be a good thing offering two sizes a small / medium and a medium / large and publish overall physical size so the buyer will can measure their own leg to see if will fit. I carry this on 8" boots and carry a SOFTT-W Tourniquet and Cleer Medical Dressing. It's comfortable, it stays in place, and really isn't visible. From a duty standpoint... it's fantastic. If you are thinking of carrying this with low cut boots or tennis shoes... I would reconsider. It's too large for that application and would not stay in place. It does it's job and get's 4 stars for that. This is a great item! Well designed, carries immediate TECC needs. It's NOT bulky, it IS comfortable for EDC, and it's discreet. My son-in-law is a LEO and was wanting something other than a larger kit to add to an already crowded duty belt or left in the car. This item is PERFECT!